When a series of mysterious murders occur in Boston, the police begin to suspect that the deaths are vigilante killings perpetrated by twins Connor (Sean Patrick Flannery, To Live and Die) and Murphy (Norman Reedus, American Gangster) MacManus. Pursued by FBI Special Agent Paul Smecker (Willem Dafoe, Spider-Man 3), the devout Irish Catholic duo maintain innocence while wreaking havoc on the town dispensing their own brand of justice—a perverse, religious mission to rid Boston of all evil men. 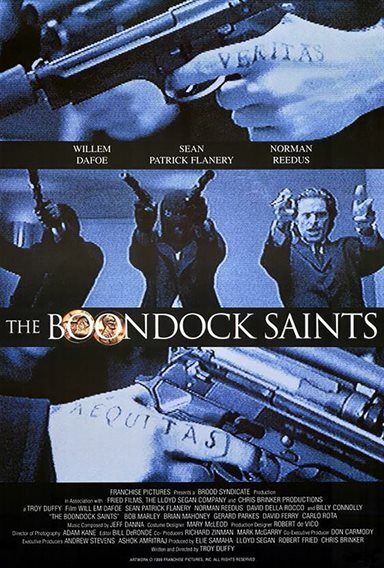 After enlisting the help of their friend Rocco (David Della Rocco, The Boondock Saints: All Saints Day), the brothers set out to hunt down every mobster and vicious criminal with unusual flair and dramatic style: by praying for each victim before the ensuing bloodbath. The Russian mob hires a hitman, the infamous ‘Il Duce’ (Billy Connolly, "The X-Files," I Want to Believe), to avenge the deaths of their comrades. However, the showdown between the MacManus twins and Il Duce ultimately leads to a shocking and unbelievable climax. Download The Boondock Saints in Digital HD from the iTunes store. The Boondock Saints images are © 20th Century Fox. All Rights Reserved.